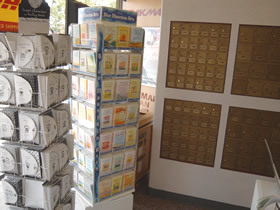 Pak Mail of Plainview carries an array of everyday and holiday greeting cards. Our everyday selection includes birthday, anniversary, new baby, thank you, congratulations, friendship… and more! Our holiday cards are available seasonally. Stock up for future events or select one for the gift you’re sending today. Pak Mail of Plainview is a full service packing and shipping store as well as a custom crating and freight shipping company. We are located in Plainview and proudly serve Plainview, Tulia, Floydada, Lockney, Olton, Kress, Amarillo, Lubbock, Littlefield, Dimmit, Halfway, Hale Center, Cotton Center, Abernathy, New Deal, Petersburg, and all surrounding cities. Request a Free Online Estimate or call us at 806-288-0199.